I remember hating CBs so much as a kid because they messed up our cable TV constantly, it was nearly impossible to watch anything. 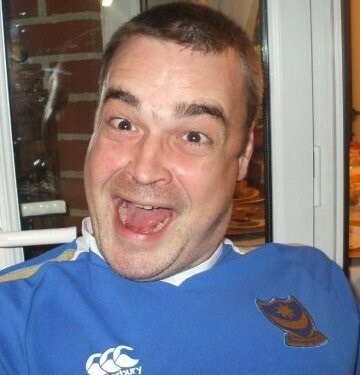 Ever few minutes a loud BRRRZZ ZZZAAPP and the picture would go all scrambled. Of course people had huge outdoor antennas and cranked the power on their CB sets to ludicrous levels. The problem is that there's a lot of "techs" out there who know just enough to be dangerous and jump into radios with golden screwdrivers and a pair of wire cutters and go to town. It makes them splatter all over the place like mad. Tune into channel 6, 27.025 Mhz, during daylight hours, it's an absolute madhouse and a lot of them bleed for 10 channels on either side. That's one reason I've taken to SSB frequencies for personal communications and shooting skip. The locals hang out on 3 in the evening when the skip dies down, but generally speaking if I'm out on the road during the day and I need to talk to my wife, we're on 36 USB. Almost zero noise, and the operators on 38 LSB tend to be more professional and knowledgeable about what they're doing, plus SSB takes up less bandwidth, so less potential for interference. ... plus SSB takes up less bandwidth, so less potential for interference. An AM signal takes up about 10 khz worth of bandwidth and is made up of the carrier and two sidebands. In SSB mode you suppress the carrier and one of the side bands, hence the term "single side band". A single side band signal is usually only about 2-3 khz wide. I've seen radios that, in AM operation, would swing to about 150 watts and bleed onto stereo systems. Flip the same radio to SSB mode and it would swing to around 300 watts and wouldn't interfere with anything at all nearby. That's not to say that a SSB signal "can't" cause interference, but because it's a narrower signal with no carrier, it takes a little more effort. Video not working properly, but anyhow found the youtube video. >1.5:1 VSWR is a problem, for sure; 3 is like telling you to buy new finals. That's putting you out with substantial loss, both on the RX and TX sides, though TX will be more adversely affected. Now, any corrosion anywhere on the lines can be a big problem, as I'm sure you know, as could be any kinks or pinches on the coax. Also, I don't see much of a ground plane by the antenna, which likely isn't affecting VSWR but could be a problem with regards to signal propagation. Check the ground potential from where you have the coax grounded outside the building to the ground potential in your building as well. That could be a significant influence on your VSWR. You should have < 0.01 ohm difference between the ground at the radio and the ground outside. I've got a shiny new stud mount I'm gonna try swapping onto the bracket tomorrow. I loaned my ladder out to a buddy so right now I can't really reach it, but that was my next step. The copper on the wire I used to go to the grounding rod was nice and clean, the washer/screw I used on either end to secure it was brand new and clean, and I used dielectric grease to keep water out of it. I'll double check the actual resistance for the ground connections as well, but if I had to pick something to blame, the only thing I can think of right off the top of my head is the stud. I just got one of these to run the radio in my shed (see the video above). Pyramid seems to make good power supplies. In the house I run a Pyramid 12 amp power supply, and it has been a very good supply, no RF interference or anything that I've noticed. 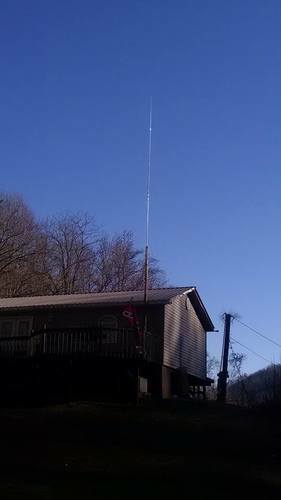 I talked skip to a guy in Florida on 38 LSB (I live in east Kentucky) one time who was on a Bearcat 980SSB in his car with a Wilson 5000 mobile antenna. He sounded clear as a bell and didn't drift at all in the 5 minutes I chatted with him while he was driving home from work. for him, the guy in the video to get a 3+ on his SWR, I'm wondering if his excess cable might be a part of the problem. he did mention corrosion and THAT will definitely cause problems in that regard. not to mention the sideband signal is much more efficient. without the carrier signal, its way more efficient. I've always had SSB systems becuase of the quality of people on side band. Cleaning up my desk a little today, re-organized the wires some, and moved my CB radio coax away from the incoming antenna for my AM/FM stereo. I had a little bit of extra coax, so I tried to roll it as big as possible without creating an RF choke. It doesn't seem to have had any effect on my tx/rx, but I'm curious from those of you who may know more about the physics of wrapping coax in loops than I do. 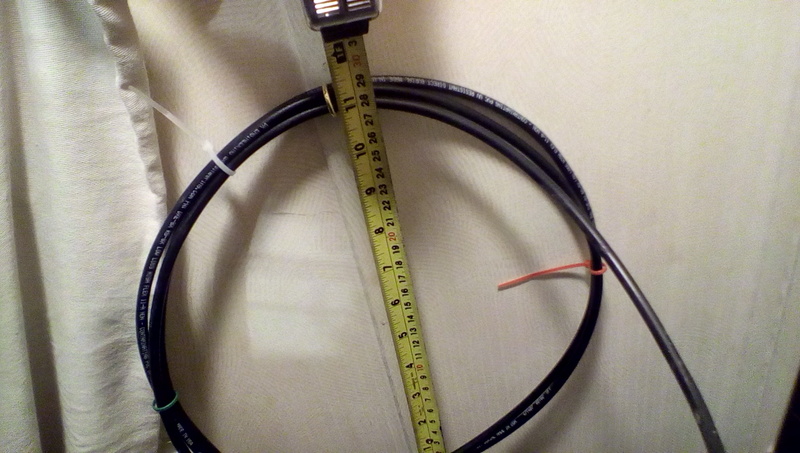 I've always been told that if you wrap coax, try to make it in circles larger than 12 inches. My question is this. Is this an acceptable "storage" loop for the excess coax, or have I just created an RF choke? It's 2 complete loops, the very short section where it's 3 wide is where it enters/exits the loop. Just uploaded a new video to YouTube; how to install a PL-259 (UHF) connector onto a piece of RG8X coax. I had done a video like this a while back but it was really long and rather poor quality because I didn't have a 2nd person to hold the camera over my shoulder for me, so I deleted the old one and recorded this one last night. Did an updated video covering my mobile installations. Shew you can tell it's New Year's Eve, the police scanner hasn't shut up since the sun went down, lol. So my brother recently bought a house and a piece of land in the next county over. The house is on a knoll in the head of a holler, and although he is in kind of an open/high spot relative to the rest of the holler, it's still a holler and has some hills on all but one side of him. 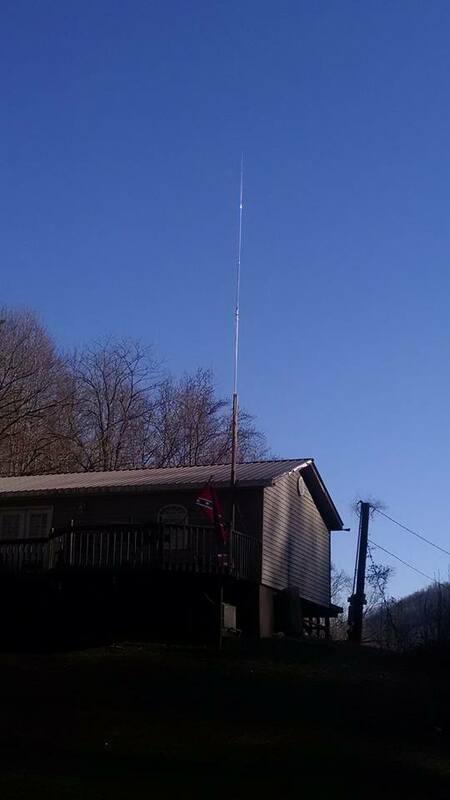 So he wanted to put up a base station antenna to use with his new Uniden Bearcat 980SSB in the house, so we made a trip to Lowes and I basically duplicated what I did for myself to get a good amount of height on my antenna for not a lot of money, and thought I would share the story and a picture for anybody who is interested either out of curiosity, boredom, or maybe you could use/modify what we did to serve your own purposes. He wanted to set up a pole like the one I made for myself but a little taller so he picked up a 16 foot treated 4x4 beam, a 10 foot piece of galvanized 1" conduit, some hurricane braces and 1" U brackets. I put it all together for him. A-99 mounted to top of the conduit, conduit centered on one side of the 4x4 and bracketed down with 3 brackets and 3 inch outdoor screws, and a piece of wood screwed to the side of the 4x4 directly under the end of the conduit to stop it from sliding down through the brackets. I made sure that the conduit overlapped the 4x4 by two feet. I figured that would give it plenty of leverage to resist wind damage without taking too much off our total height. It was strong enough that when we first started erecting it I lifted the whole thing by the conduit. I zip tied the coax and lightning ground wire to the conduit to stop wind from jerking them around and to keep weight off the PL-259. He bought 100 feet of RG8X coax for the run and I soldered a couple Amphenol connectors onto it for him. I peeled back enough of the shield so I could bite some of it in the threads of the reducer for improved stress handling (less strain on the center pin if something yanks down) and also shield ground continuity (plus I soldered into the holes to help with shield/ground continuity). I cleaned the inside of the A-99 connector since he had used it at his old house with some high concentration rubbing alcohol and then applied a liberal coating of dielectric grease to the PL-259 before connecting it to the antenna. I gave it a snug fit with a pair of channel locks, then wrapped the connector area and first few inches of the coax (making sure not to block the antenna drain hole) with coax seal to hopefully keep rain water out of there. I also cleaned inside the connecting areas of the antenna with rubbing alcohol and filled the female ends with dielectric grease before re-assembling the antenna with the locking washers. Something to keep in mind here is that fluids do not compress, and when we tried assembling the antenna we felt some pressure about halfway down and thought we had cross threaded it. I re-threaded it 3 or 4 times and got a little farther until I just applied a little extra force and some of the dielectric grease finally farted out around the threads and let us tighten her down. For future reference it may be a good idea to not fill the female ends completely full of dielectric grease, but just make sure they have a good liberal coating. I recommended RG8U for a run that long, but he had already bought the RG8X so we went ahead with it. The coax wraps around and enters one of the vents for his loft and I bored a hole in the roof above his radio desk to drop the coax down through. Excess coax is going to be rolled up and hung from a nail in the loft, and I zip tied it where it entered the house to a board so the wind can't cause it to yank on the connections and things inside the house, and left enough of a droop in the portion of coax outside the house for rain water that runs down it to drip off without following the line into the house and rotting/molding the wood. The only thing I'd like to do is swap in a proper 8 foot copper grounding rod; right now the grounding rod is a 4 foot steel coal mine roofing bolt which I found (I used one for a while) rusts and causes continuity problems. The hairiest part was erecting the whole thing once we got it all assembled, because once you get to about 45 degrees the majority of the weight is all on your shoulders, and you really don't want to drop it or for that bottom end to kick out and ruin everything you just put together. I just had him put downward force on the lower end of the 4x4 to keep it from kicking up or sliding and I stood it up for him, then the two of us twisted it around and used hurricane braces to mount it both to the porch floor (on top of where a cross member runs) and to the eave of the house (screwed into a 2x4 inside the eave). The good thing about having the 4x4 on bottom is that it's so much heavier than the antenna and the conduit that once it's vertical, the wind can whip the antenna around like a wet noodle and exert almost no pressure at all on the house or hurricane braces. This is almost identical to the way I have mine set up except I used a 12 foot 4x4 instead a 16 footer. We're discussing replacing one of the hurricane braces with a heavy duty hinge so that if it ever needs work, he can take the hurricane braces loose and lower the whole thing by himself if I'm not available for whatever reason. Once we got everything set up and the coax ran, we hooked up the radio and checked the SWR and it's a perfect 1.0. Made contact with some people in the next county over and they said it sounded good. I talked to him from my mobile (Cobra 148 GTL) for about 20 minutes on the way home before I started going in and out of these big mountains and I lost him (both of us barefoot radios so only 12 watts PEP). We talked on single side band and I have to say, his Bearcast 980 is one of the clearest sounding single side band radios I've ever heard. It was crisp and clear, didn't drift (at least that I could tell), wasn't high pitched, I mean it genuinely sounded good on single side band. Here's a picture of it once it was all said and done. I wrote this mainly for my own purposes and just thought I would share it with anybody interested. I basically just wanted something stored locally on my computer that I could use to calculate wavelength quickly without requiring internet access. Now I have one more little script in my folder of stuff that I can just double click, punch in a number, and have it spit out all the numbers I would want instantly. I'll probably zip it up with a copy of EasyGUI a little bit later, but for right now if you would like to try it out, port it, modify it, etc., here's the source code. If you have Python installed you should be able to just copy and paste this into any text editor and save it as "filename.py" and double click it. textonly = 1 #If textonly is 1, graphical windows will be displayed. textonly = 0 #If textonly is 0, graphical windows will not be displayed. #it fails because of not being a number. "Quarter wave: " + str ( round ( ( quarterwave * 12 ), 2 ) ) + " inches.\n"
I packaged that little wavelength calculator into a more easily share-able format. Windows users have a compiled exe that will install shortcuts for them. Linux users (or Windows users who don't want to download a compiled/binary exe) can download the .tar.gz archive, extract it, and run the freqlength.py file directly with Python 3. Linux/BSD users can also run the install.sh file as root to have it installed to its own folder in /opt, a symbolic link placed in /usr/bin, and icons placed on their desktop and in the applications menu. Mac OSX users can download the .tar.gz file and run the freqlength.py file with Python. The end result was that I just wanted to be able to have something that did not depend on internet connectivity where I could just click a button, punch in a freq and get all the numbers I want instantly. Since there's still quite a few active radio operators in some online communities, I figured I'd take a few minutes to package it up and share it. New CB radio related vlog has been posted. I got myself the GPK1 ground plane kit for my A99 and installed it. I'm thinking of replacing the A99 as well, or at least painting it, although I'm not sure what kind of paint would be acceptable to use. Obviously no metal flakes, but I'd like to find some paint that I know for a fact is just plastic or rubber or something. Also the vinyl cap is starting to dry out and crack. It'll definitely need something done before cold weather hits and everything starts freezing. Last year around January we bought and moved into a new house. I've had my CB antenna up since then, but haven't had it properly grounded. I took care of that issue the other day.